Despite the cost this is great fun, and if Ed's your hero it's unlikely that anything else will do. The authentic tone. That Unchained preset. Flangers can often be the most unsubtle of effects and, if you're not careful, they can smother your carefully crafted tone with all manner of jets, swirls and wooshes. Trust Edward Van Halen to use such a device to give a further injection of pace into a number of the band's classic riffs. Most notably it's the intro riff to the track Unchained (from 1981's Fair Warning) that benefits and, in a stroke of impressive forethought, MXR have included that setting as a preset. 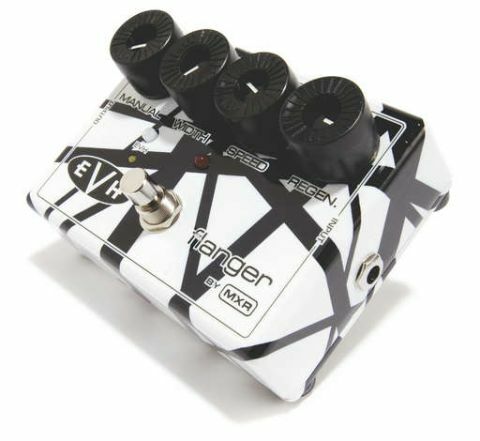 This pedal operates in the usual manner but, if you have the small EVH button depressed when you turn the pedal on, you have just the right setting to play that iconic riff. MXR's EVH Phase 90 is resplendent in the trademark red, white and black stripes, and the livery here is from an even earlier period: the original black and white paint job from Edward's Frankenstein Boogie Bodies guitar. What's more, certain parts of the front panel glow in the dark. Power comes from a pair of standard nine-volt batteries and, as you'd expect, the pedal is built like a tank. Regardless of the undeniable quality across the board here, that £215 price tag is very difficult to swallow - a BOSS BF-3, for example, is just £89. As a generic flanger the modulation is warm and organic with plenty of headroom within all four controls. As with all flangers, it's best used sparingly for maximum effect.